Candice Teresa Neaves began practicing yoga in 1999 and has been teaching since 2013, after completing her 200 HR Yoga Teacher Training with Cloud Nine Yoga. Passionate about holistic health, organic farming and taking excellent care of the earth, Candice says yoga and meditation help her stay grounded, strong (both physically and mentally) and deeply connected to her soul purpose. In a world that’s constantly changing, yoga provides an anchor for inner peace, serenity and truth, enabling her to navigate life’s experiences with mindfulness and grace. Through her yoga practice, she’s naturally healed herself of depression, full body eczema/psoriasis, and various injuries. Her own healing and desire to change the world has inspired her to help others heal and transform their own lives through yoga. 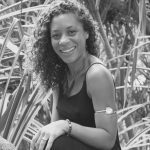 Candice offers classes from her organic farm in Hawai’i where students are able to connect with nature during practice. “The bird songs, soft breezes, majestic mountains and surrounding fruit trees serve as an invitation back to the present moment and remind us of our true nature ~ whole, complete, total.” Candice’s classes invite students to connect deeply to their own breath, move with presence and mindfulness, honor the unique needs of their bodies in the moment and dive deeper into the realms of self love, inner transformation and soul liberation.